Mention kimchi and most thoughts turn towards the familiar chili-seasoned, fermented Napa cabbage (baechu kimchi) provided in various degrees of quality as an integral member of banchan in Korean restaurants. While it's true that this rendition is the most popular today, kimchi throughout the centuries has been a staple food of the Korean people using a wide variety of fruit, vegetables and seasonings. Shopping for kimchi at your local neighborhood Asian market can be a mind-numbingly baffling task - with the plethora of tubbed and jarred versions available it's impossible to choose. Historically kimchi was prepared differently depending on the season, with the dish being consumed fresh in the warmer seasons and fermented underground in huge earthenware jars during the colder months (baechu kimchi is typically an autumn kimchi). 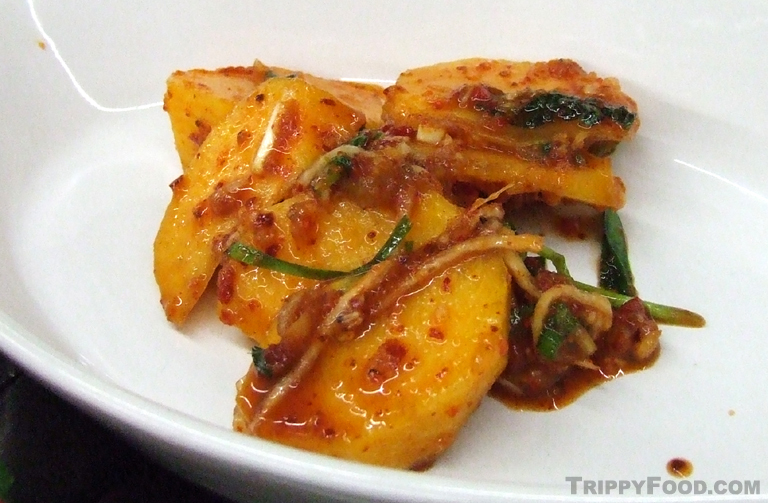 Kimchi is a dish that incorporates complex tastes, smells and textures, and because of the multitude of preparation methods, differences in fermentation times and temperatures, each experience eating it is unique (although refrigerators designed specifically for making kimchi create more consistent results in a controlled environment). Do any cursory research on kimchi and you'll discover that it also garners high ratings as a superfood because of the presence of beneficial lactobacillus that forms during the fermentation process, it is low in fat and calories, high in fiber and contains considerable amounts of vitamins A, B1, B2 and C. Some questionable studies suggest that it may even ward off avian flu (a fact that you should find comforting if you're a chicken subsisting on a diet of kimchi). 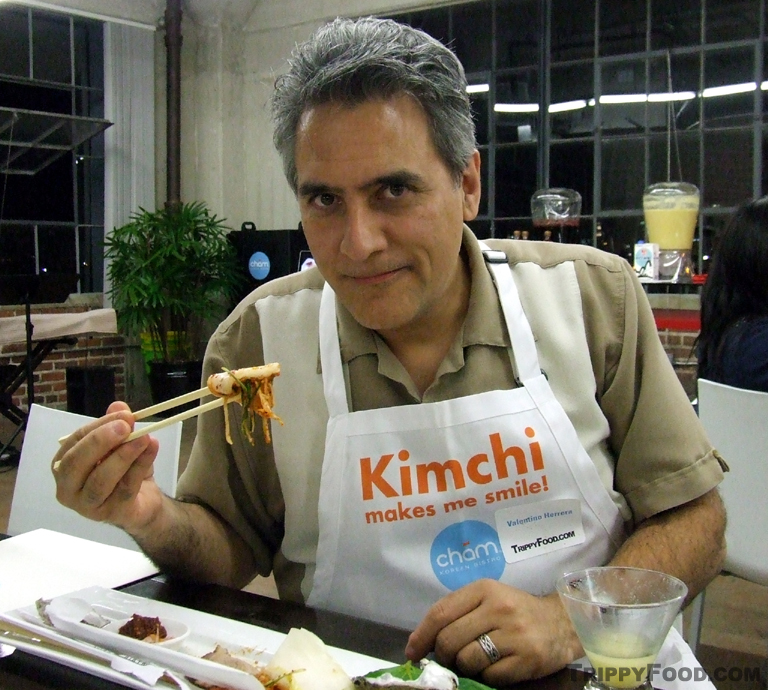 I have come to terms with my kimchi addiction and no longer entertain the notion of breaking into the local 99 Ranch Market at 3 AM for a kimchi fix, but the recent invitation to attend a kimchi-making class at Chām Bistro's R&D Kitchen in Vernon, California was like giving a crank-head a spot on a meth lab assembly line - an opportunity too good to pass up. Chām Korean Bistro in Pasadena, California was opened to the public as a direct result of the culinary work done at !iT Jeans (a denim fashion line founded by CEO Kimmy Song). !iT Jeans creates clothing in a progressive environment; in addition to a fully equipped gym and a proliferation of art on the premises, Song provides meals for the staff in a state-of-the-art kitchen. Many of the meals served (as well as the dishes served at Chām Korean Bistro) are developed and executed by Chef E. J. Jeong (late of A.O.C and BOA Steakhouse); Jeong served as the coach for the class that I attended. Prior to the start of the session we applied generous quantities of pickling materials, including a fresh, fruit-packed cocktail featuring Korean bokbunjajoo (black raspberry wine), the citrus yuzu and sparking wine, and a tropical beverage featuring makgeolli (Korean rice wine), pineapple purée, agave syrup and Sprite that tasted like a piña colada in search of a coconut. Presumably to keep us from eating our class projects, some light Korean tapas-style dishes were also available; these included pickled neon-green seaweed, sautéed kimchi and spicy tuna in tofu pockets, what I like to call "ahi-pops" (seared ahi tuna with chimichuri on a stick), and my new favorite: roasted and salted kale. The kale made the sound of dry, autumn leaves and dissolved like rice paper on my tongue; there was only the slightest smoky bitterness familiar to kale lovers, and the coarse salt grains coating the leaves cracked like Pop Rocks. With our appetites whetted temporarily it was time to suit up and get down to business. Our instructor demonstrated the process from the beginning, starting with the scoring of the large heads of Napa cabbage near the bottom and splitting the sections for an initial soaking in salted water. She extracted wilted sections from a bowl in which cabbage leaves were soaked prior and instructed us on how to salt between the leaves and place the sections back in the briny bath. A third bowl held leaves that had already been rinsed and were soft, pliable and ready for the big treatment. In yet another large steel bowl (of which seemed to be in limitless supply) she combined the pickling ingredients, starting with a creamy, translucent rice porridge that looked like library paste and dried and crushed red chili peppers. After blending these together, she added julienned daikon radish, loosely chopped mustard greens, Korean chives, an anchovy-based fish sauce and ultra-salty tiny shrimp (for protein) and Asian pear (for sweetness). These ingredients were all mixed together by latex-gloved hand (although I'm not sure if it was for sanitary reasons or to avoid chemical burns from the chilis); when the concoction was a limp, wet mess it was time to load up the cabbage sections. We pulled back each of the leaves and slathered a generous dollop of the organic goop over and between them before folding the bunch over; it was delightful wet-work and I felt like an obstetrician on game day delivering an 8-ounce Napa-baby. I delicately placed my little bundle of culinary joy into a Mason jar to take home and allow to gestate for 20 days in the back of my refrigerator. Out of curiosity I licked my gloves to see what the substance tasted like prior to fermentation, and I have to admit it was pretty tasty. NOTE: This cost for this event was provided by the restaurant. The content provided in this article was not influenced whatsoever by the organizer of the event. 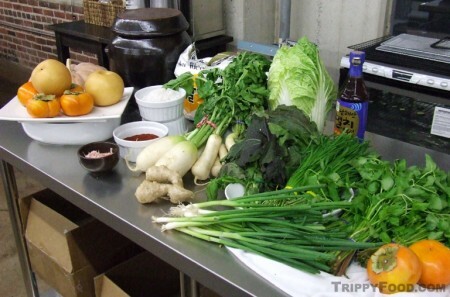 This entry was posted in Asia, Trippy Food (Tasty flora and fauna) and tagged !iT, ahi, anchovy, Asian pear, avian flu, baechu, banchan, Bistro, bo ssam, bokbunjajoo, bossam, CA, cabbage, California, Cham, chef, chili, chimichuri, chives, daikon, E. J., EJ, fermentation, fish sauce, Hama Hama, Jeans, Jeong, kale, kimchi, Kimmy Song, Korean, lactic acid, lactobacillus, makgeolli, mustard greens, Napa, oyster, Pasadena, peppers, persimmon, pork, porridge, radish, raspberry wine, rice wine, salt, seaweed, sesame leaves, shoulder, shrimp, superfood, tofu, tuna, Vernon, vitamins, yuzu. Bookmark the permalink.